CPU-Tweaker allows to change memory timings under Windows. You can read principal and secondary timings, and eventually change these timings values. -"CPU-Tweaker is only for CPU with Integrated Memory Controller !" So basically you're telling me that my Athlon 64 X2 6000+ havent got an integrated memory controller ?? AMD INVENTED IT FOR GOD'S SAKE !! If you have a Nvidia based chipset just use "Nvidia System Tools with ESA support", i can change my timings correctly from windows with it ! All you can do with this tool is either make your system slower or else make it crash. Maybe it is my OS or I have no idea, but it doesn't work on either of my two laptops, nor my desktop. (Celeron, Centrino, and Q6600). Does this support anything? All three computers, that I have tried it on, all three are different, it doesn't support any of them. I wish that I could rate it in the negatives! 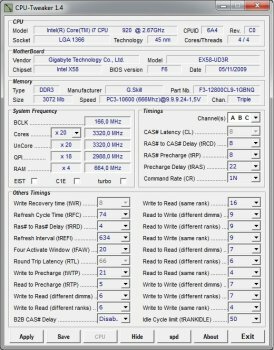 No support for a Intel Q9550???? What a joke. 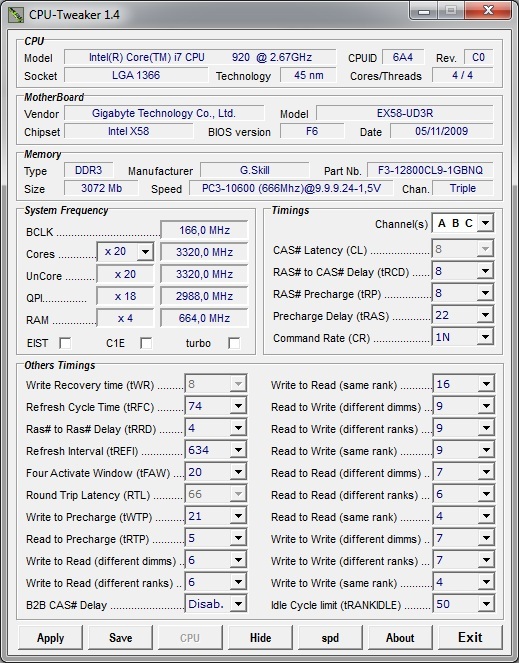 Worked well on my Phenom II 940 running Vista x64. This tool allowed me to lower my CPU voltage which was not possible from the Bios of my Foxconn A79A-S motherboard. Overall not bad for a beta version! Not for my Intel P8400 CPU. Huh? Worthless then. Don't call it a CPU tweaker unless it can tweak all modern CPUs. Ok, I tried this program, immediately came up with "Not For This CPU" message. They should have said in description "For Corei7 processors only". Then, shortly after message, explorer crashes. Have a core2 quad 9550 and Vista 32bit OS, BTW..